I went to the store tonight to get an exciting list of items including yogurt for the dogs, eggs that will be mostly for the dogs, creamer for tea, Drayno and a flea comb, also for the dogs. As I took a detour through the U.N. of grocery store isles otherwise known as the "ethnic foods" section I saw it. There it was on a low slung ankle high shelf. It called to me, it beckoned to me. My Datu Puti love affair was about to begin. Datu Puti graces our shores all the way from the Philippine Islands. Bear in mind that I am not as familiar with Philippine foods as I am with other Asiatic tasty yum yums. 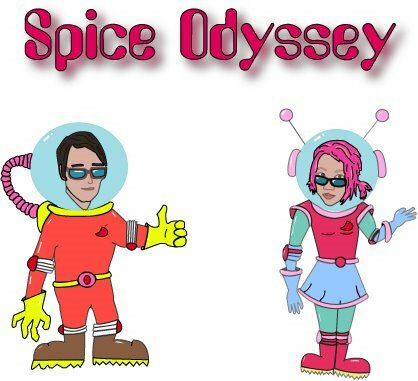 I've tried a few different dishes and, meh. I do enjoy the Adobo, but beyond that, I dunno. 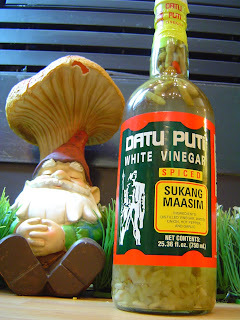 Datu Puti is basically white vinegar with chilies and garlic. What more do you need? Not much. I intend to whip up something using Datu Puti very soon. Also Datu Puti is real fun to say. I cracked open this rather sizable bottle and tried one of the peppers and I have to say it was a delicious bit of spicy goodness. On a side note making an infused vinegar is pretty easy and I could have done this myself but the label is far to awesome to not be in our kitchen.